Former Chelsea midfielder Cesc Fabregas believes Eden Hazard will remain loyal to the west London club by signing a new long-term contract. The Belgium international has been in a contract standoff with the Blues over the past year and this has questioned his position at the club with his existing deal expiring at the end of next season. Speaking to Cadena SER, Blues favourite Fabregas has suggested that Hazard may commit his future to the Capital outfit, given he has remained loyal to the club over the years. “I think he’s going to extend his contract with Chelsea. He’s a loyal player. He told me he would never fight with Chelsea to leave. This is his club, he has won so much in England," he told Cadena SER. 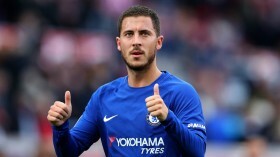 Hazard has already bagged 12 goals and 10 assists in the Premier League this term and he is already on course to experience his best scoring season despite the Blues' struggles to keep up with the title challengers.